Reference number for this case: 4-Oct-54-Forgès. Thank you for including this reference number in any correspondence with me regarding this case. 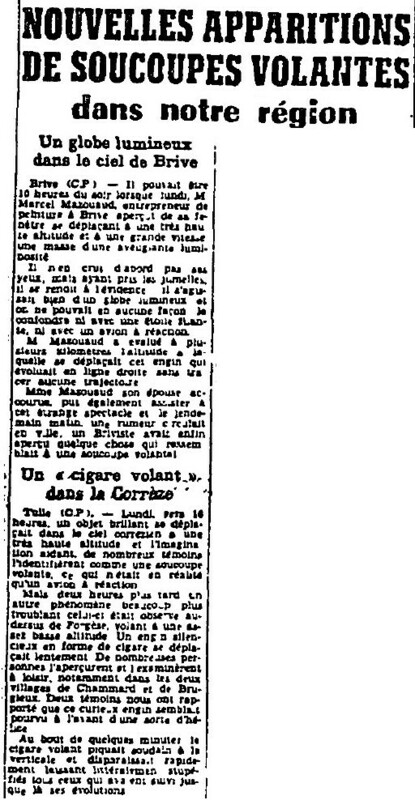 The newspaper La Dépêche du Midi for October 6, 1945, reported that at 6 p.m. on October 4, 1954, a silent cigar-shaped craft was observed above Forgès, moving slowly, flying at low altitude. The newspaper said many people saw it at length, including in villages of the area. Two witnesses - whether they were in Forges or in one of the nearby villages is not specified - had told the newspaper that the "curious craft" seemed to have a kind of propeller at the front. After a few minutes, it had suddenly dove vertically and "disappeared" quickly, leaving in awe all those "who had followed its moves until then." The apparently strange craft remains unidentified to me, but the information is not sufficient to exclude that it could have been some plane or helicopter. It should be noted that it is not certain that there were witnesses in Forgès; it is possible that only witnesses in the surrounding villages saw it above Forgès. 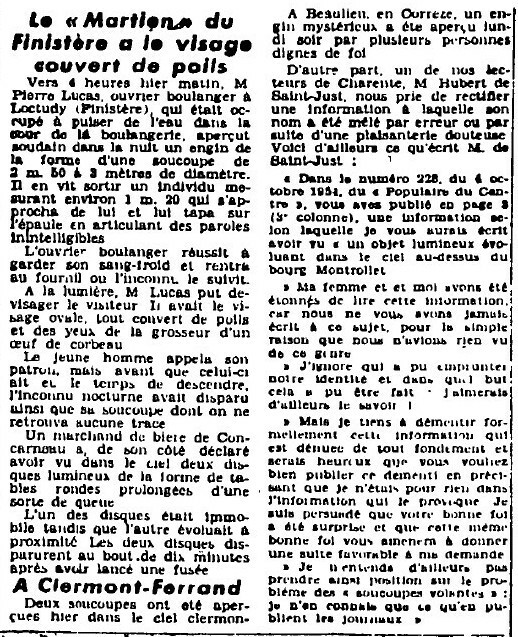 [dm2] Article in the regional newspaper La Dépêche du Midi, France, page 4, October 14, 1954. 1.1 Patrick Gross January 7, 2017 Additions [dm2], [pc1].